We offer two different services on Sunday morning, fall through spring. We go to one service at 10am during summer months. We would love for you to join us! 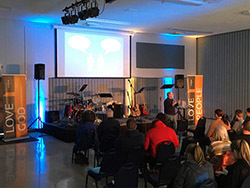 The Conversation Contemporary Worship service at 9:15 a.m. in the Fellowship Hall is informal; ministers wear street clothes, the sermon is an interactive discussion, a praise band leads worship music and we sing with words on the projected screen. 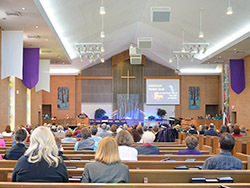 The Sanctuary Worship service at 10:30 a.m. is classic and traditional; ministers wear robes, acolytes light candles, a choir leads worship music, and we sing from hymnals or from a projected screen.